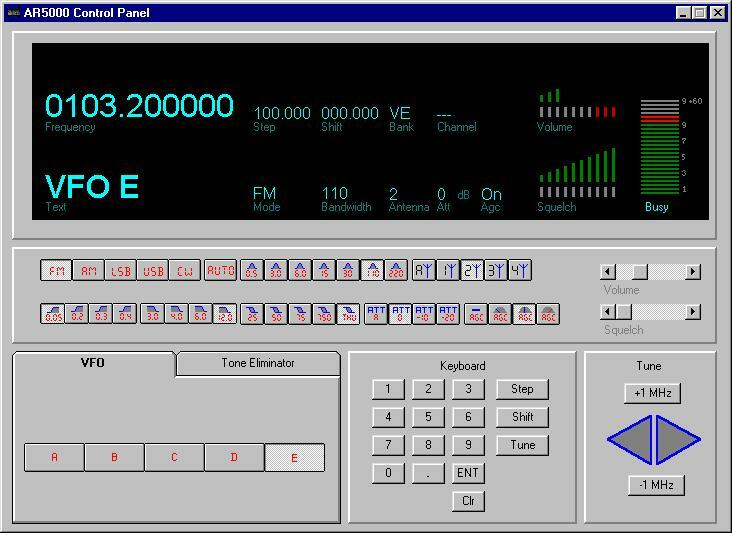 ARC5000 Programming software for the AOR5000. ARC5000 provides a set of tools you can use to setup/manage your AR5000. Unfortunately operating the AR5000 by the keyboard is not ergonomic but the very nice RS232C interface can help you. Note that the ARC5000 software is only a tool for setting up the radio like memory/search banks/bandplan. The software does NOT support full remote control and scanning options although the spectrum analyser can log data but search speed of the analyser is only 2-4 freq's a second. As you probably noticed setting up a memory bank using the keyboard is very time consuming because of bad ergonomics (IF Bandwidth is a Shift option). Every memory channels holds 24 parameters(!). My ARC5000 Memory Manager reads all these parameters and presents them in a friendly spread-sheet format. Link an offset to your memory channels. ARC reads the actual offsets you programmed. The AR5000 has a nice future called AUTOMODE. 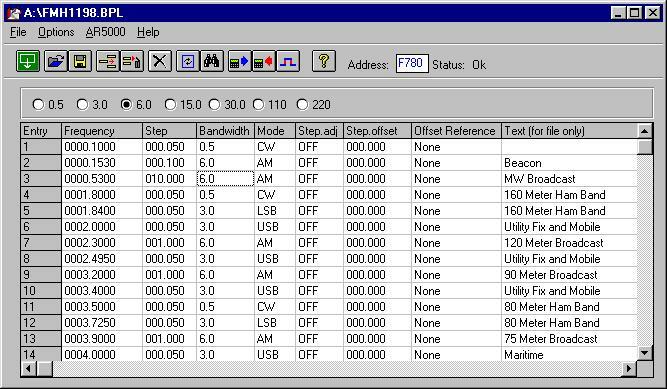 In AUTOMODE the receiver uses a table as a reference for setting mode/step/bandwidth/step offset. Unfortunately this pre-programmed bandplan does not match your local bandplan. This tool is used to reprogram your bandplan. The data is read from the EEprom and presented in a spread-sheet format. You can add/remove/modify entries in the table and send the new data back. A maximum of 128 entries is available. The software includes the USA and Europe bandplan that came with the AR5000. Use these to build your personal bandplan. This new tool introduces the first virtual AR5000 control. The window is divided in 3 sections. The top section is the virtual display showing more info then the AR5000 display itself. It shows all the current settings including volume/squelch/s-signal. The middle section is a large toolbar were you can select Mode/Bandwidth/Antenna/Audio Filters/AGC and setup Volume and Squelch. The bottom section is used to input new data. Program the frequency/step/shift using a virtual keyboard. Also tuning the AR5000 is possible. You can also setup the tone eliminator. The virtual control center will get support for memory and search banks in the future. The famous ARC spectrum analyser is also available for the AR5000. See other site for info and more screenshots. The spectrum analyser includes cumulative, continue and single peak mode. A powerful ZOOM option let's you zoom in at a certain range with a few mouse clicks. The 5000 is automaticly updated with the new search range. A hit spectrum and extended log options are also available. You can setup all colors and horizontal/vertical lines. The EASY LISTENING option tunes the 5000 to a received frequency by double clicking a peak in the Spectrum. ARC5000 includes the spectrum analyser software too. More info and screenshots for the Spectrum Analyser. 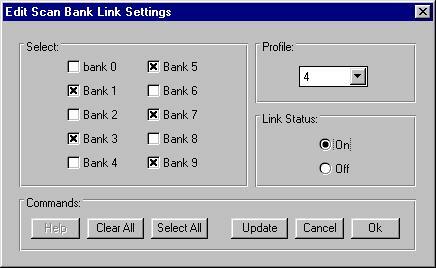 Setup your search banks. The data is presented in a spread-sheet window like the memory manager.